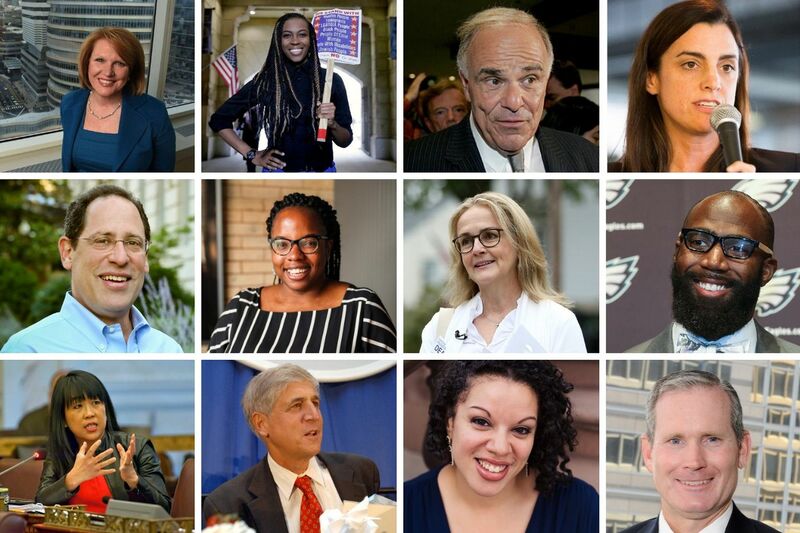 We asked 15 prominent Philadelphians: What's the most important change Philly needs in 2019? As 2018 draws to a close, it’s a good time to take stock of accomplishments (Hello, Super Bowl) and missed opportunities (Goodbye, Amazon). It’s also an opportunity to look to the days ahead, to be optimistic about what the future might hold. The Inquirer’s Opinion department has spent the last few weeks asking people from around the region: What is the most important change the Philadelphia region needs to see in 2019? From left: Eagles player Malcolm Jenkins, Philadelphia City Controller Rebecca Rhynhart, and former Pennsylvania Gov. Ed Rendell. Philly has powerfully reformed criminal justice, reducing our jail population by almost 40 percent in three years. While we’ve made headlines as a model city for its progress, our beloved city has also generated national attention for commonsense reforms that have yet to be put in place … specifically around parole. One out of every 22 Philadelphians is on probation or parole. A staggering 55 percent of people in Philly jails are held indefinitely on a “detainer,” with almost no chance at pretrial release, because they are accused, but not convicted, of some new crime or a small violation. They cannot be bailed out. Philadelphia has so much going for it, but we need to make sure that our local government doesn’t hold back our city. Too often, city tax dollars are wasted, or used to benefit the connected few instead of the majority of our residents. People know this, and they want change. Philadelphia has felt the negative effects of the opioid epidemic in a very real way. In 2017, 1,217 people died of an overdose in Philadelphia. But there is a way to reduce this carnage in the future: Set up a safe injection site. At a safe injection site, users would bring their own drugs and needles and inject themselves in the presence of trained medical personnel. Before users take any drugs, they will have to meet with counselors who will urge them to get treatment and can immediately place them in a treatment program. If the users choose to take drugs, the trained medical professionals will be prepared to administer Naloxone, an overdose reversal medication, in the event that the user has a bad reaction, which is not uncommon given the level of fentanyl found in heroin in Philadelphia. Experience in other cities shows that a safe injection site is likely to save somewhere between 25 and 75 lives per year. From left: Philadelphia City Councilwoman Helen Gym, Center for Hunger-Free Community's Mariana Chilton, and Pennsylvania Congresswoman-elect Madeleine Dean. Center City District's Paul Levy, Well Fargo's Tiffany Tavarez, and Drexel University's Bruce Katz. In the nine years since the recession, Philadelphia has added jobs every year, an average of 1.4 percent increase per year since 2010, our longest winning streak in decades. But these gains pale in comparison to the average annual growth of the 25 largest cities in America (2.3 percent per year) or even the national average (1.7 percent per year). Had we been average we would have had about 50,000 more jobs than we do today — the equivalent of Amazon coming to Philadelphia. The recession devastated those limited in education or skills. Philadelphia’s poverty rate surged from 23.8 percent to 28.4 percent from 2007 to 2011. As we started adding jobs, the number in poverty declined by 4,600 each year; dropping the rate to 25.7 percent. That’s still appallingly high, but the message is clear: Grow jobs, reduce poverty. So why do we grow so slowly? Two diverse tax commissions suggested looking in the mirror: Support government with high taxes on workers and business and both will leave. Rely more on real estate taxes, there’ll be more growth and more for schools. Among big cities, we have the highest wage tax and the highest poverty. We’re the only big city taxing both gross and net incomes of business. The Welcoming Center's Peter Gonzales, Mayor Office's Amber Hikes, and Phillies co-owner John Middleton. The most important change we need is an embrace of economic growth strategies where people of color, women, people with disabilities, immigrants, and refugees are shaping policies and programs that directly impact our communities. By ensuring that decision-making bodies in government and business reflect our increasingly diverse population, we improve the odds of making smart investments in our education and workforce systems, health care and social services, infrastructure, housing, and transportation systems. Homelessness is a complex issue that is solvable in our lifetime, but surging social forces have put us on the verge of a new homeless crisis. The rise in addiction, coupled with growing poverty, mental illness, and young adults experiencing homelessness is elevating the issue to a whole new level. The critical change Philadelphia needs to see in 2019 is our community coming together, forging critical partnerships to address the issues of addiction and other underlying causes of homelessness. Project HOME understands the impact these new forces create and responded with MPOWER, a public-private partnership that draws on a powerful network of people and ideas to scale solutions. In less than a decade, MPOWER has multiplied Project HOME’s impact by 163 power. Through the partnership, Project HOME leveraged $25 million into more than $250 million, providing services to more than 15,000 people and ending chronic street homelessness for more than 2,000 people. We need to better address the disproportionate impact of poverty, unemployment, and homelessness on specific populations, including LGBTQ people of color and especially transgender women of color. Even when controlling for levels of education, these populations are still underpaid and underemployed. Deloitte's Rob McNeill, Children's Hospital's Madeline Bell, and Philly Startup Leaders' Kiera Smalls. Philadelphia’s success is rooted in the success of its people, and nowhere is this city’s booming energy more evident than in the thriving start-up and tech communities. However, there can be financial and cultural barriers that make it hard for everyone who wants to be a part of these communities to learn and grow. This can make it hard to build the next generation of leaders. In 2019, one of Global Philadelphia’s major areas of focus will be the United Nations’ Sustainable Development Goals (SDGs). We urge Greater Philadelphia businesses and communities to get behind these goals, which include eliminating poverty, providing quality education, taking care of the environment, and promoting gender equality, among others. Our collective work toward the SDGs will not only boost our region’s economic and social well-being but also increase the Greater Philadelphia area’s visibility internationally as a forward-thinking destination for commerce and tourism, and create more goodwill for our community as a force for inclusion, equality, and sustainability. While Philadelphia has much to celebrate, we can’t lose sight of the fact that it’s a place where thousands of children struggle. Many of our youngest residents are hungry, homeless, and unhealthy. Some of these challenges are linked to their environment: The neighborhoods children live in and even the condition of their homes have a profound impact on their health. Children’s Hospital of Philadelphia has many initiatives that address the crises our children face, including a partnership with the Philadelphia Housing Development Corporation, that creates healthier housing for children with asthma.